I continue my quest for an unofficial history of visible brushstrokes in paintings, from the early Renaissance to Monet and the Impressionists. Last time I found small passages of painterly work in the products of Jan van Eyck’s workshop, mentioned El Greco, looked at Rubens’ wonderful oil sketches, and showed clear gestural marks in some of Rembrandt’s late paintings. Brushstrokes seem then to have gone into hiding until the latter half of the eighteenth century, with barely a flicker visible in the carefully finished paintings completed until Francesco Guardi was active in Venice, from the 1750s. From then until his death in 1793, he followed Canaletto in painting views of Venice which are now in galleries around the world, but seldom on display. 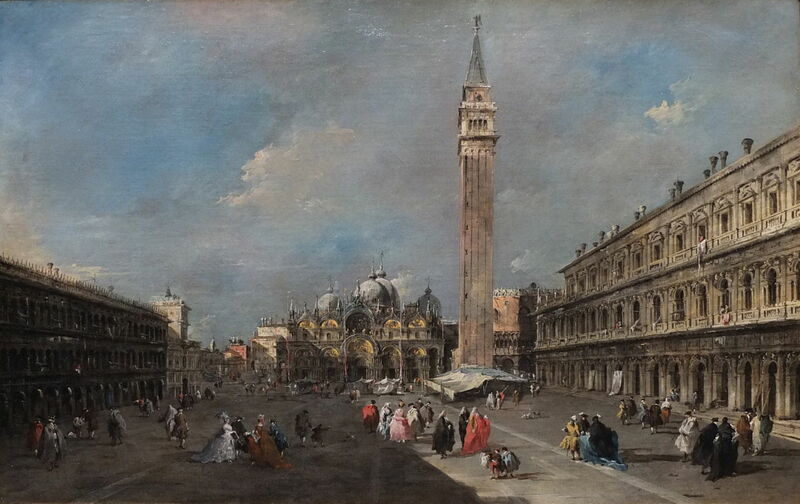 Perhaps his best-known is a late view of Piazza San Marco (c 1775). Unlike Canaletto, Guardi was much freer in his handling of paint, as seen in a detail of that painting. 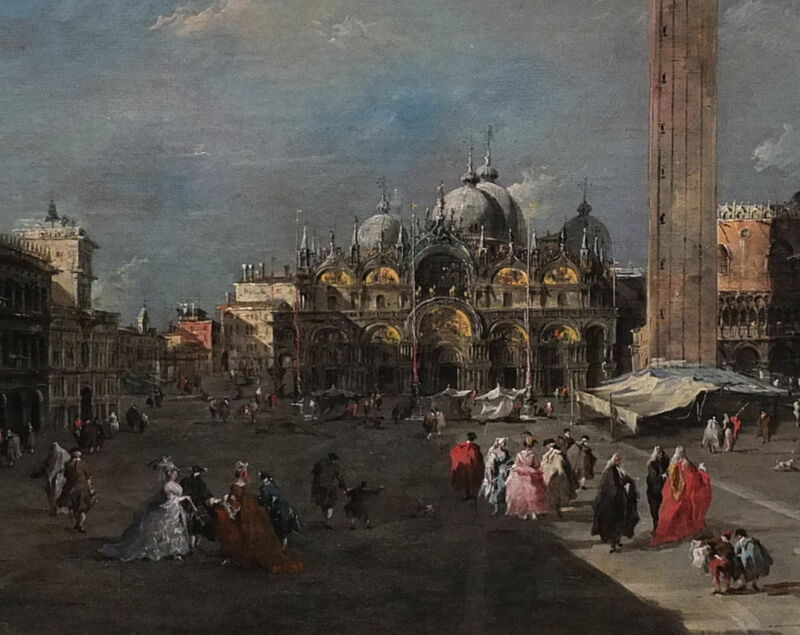 Francesco Guardi (1712-1793), The Piazza San Marco, Venice (detail) (c 1775), oil on canvas, 55.2 x 85.4 cm, Scottish National Gallery, Edinburgh. By Ad Meskens, via Wikimedia Commons. The Basilica lacks the rigorous rectilinear appearance of earlier depictions, its multitude of aerial spires and decorations becoming more irregular and jumbled. Marks are most visible in the fabrics seen clothing the figures, in awnings, and other staffage, and in the clouds above. I have been unable to discovery why Guardi’s style became so painterly, but this can be seen in his other vedute (views), and in smaller and even freer capricci (imaginary scenes), such as those of the National Gallery, London. For most painters of the eighteenth and early nineteenth centuries, brushstrokes continued to be visible only in their private sketches and plein air studies. This was particularly true of John Constable, although in his case we are now able to enjoy many of those works which he did not exhibit. This early oil sketch of a lane near his home in Suffolk, England, was executed very quickly onto paper, which was later laid on canvas. 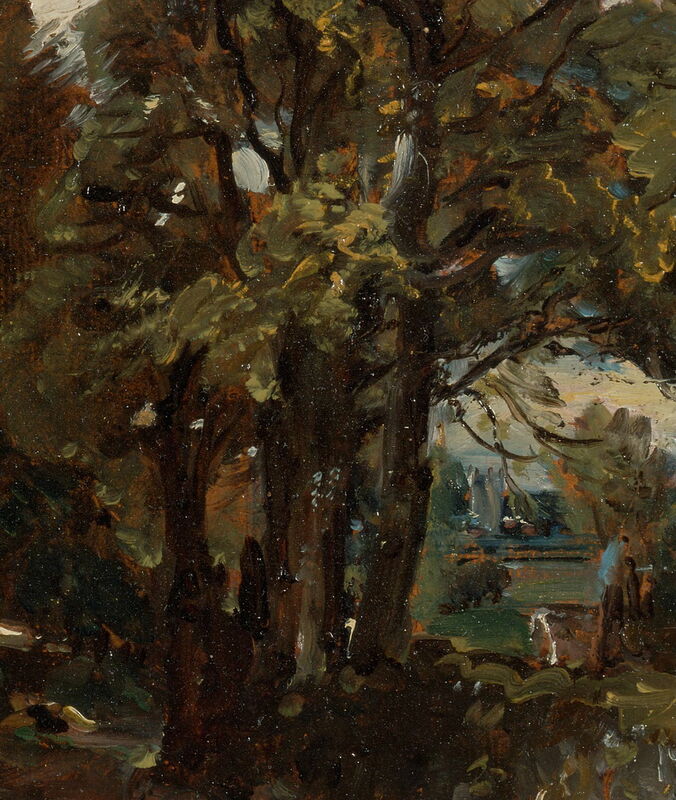 John Constable (1776–1837), Fen Lane, East Bergholt (detail) (c 1811), oil on paper laid on canvas, 22.1 x 19.5 cm, Yale Center for British Art, New Haven, CT. Wikimedia Commons. Its marks are abundant, very visible, but not for hanging in the Royal Academy! Throughout his career, Constable was a prolific sketcher in oils. This is an example of a plein air sketch he made at Hampstead, then a largely rural area just outside London. Many of these were intended to document clouds and the effects of light in the sky, an activity referred to as skying. 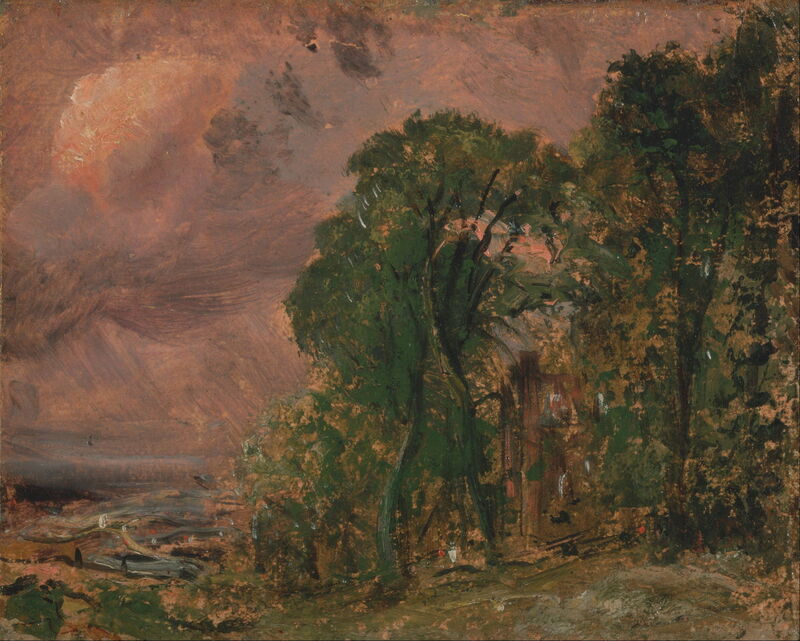 John Constable (1776–1837), A View at Hampstead with Stormy Weather (detail) (c 1830), oil on paper on panel, 15.6 x 19.4 cm, Yale Center for British Art, New Haven, CT. Wikimedia Commons. He also made series of oil studies for each of his major finished works, culminating in a very loose full-sized version, prior to painting the final canvas. Most have survived, and show his thoroughly painterly approach which was concealed from the public view. There is a particularly good collection in Mark Evans’ (2011) book John Constable, Oil Sketches from the Victoria and Albert Museum (ISBN 978 1 851 77626 9). 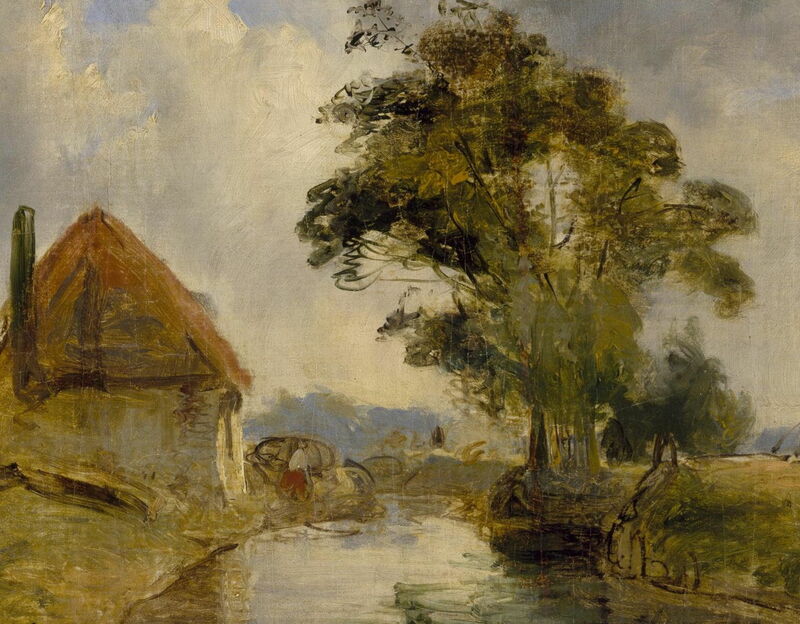 JMW Turner, Constable’s contemporary and rival, was (as you might imagine) quite different in his approach. He normally made sketches and preparatory studies in watercolour, so his oil paintings were those intended for exhibition and sale. 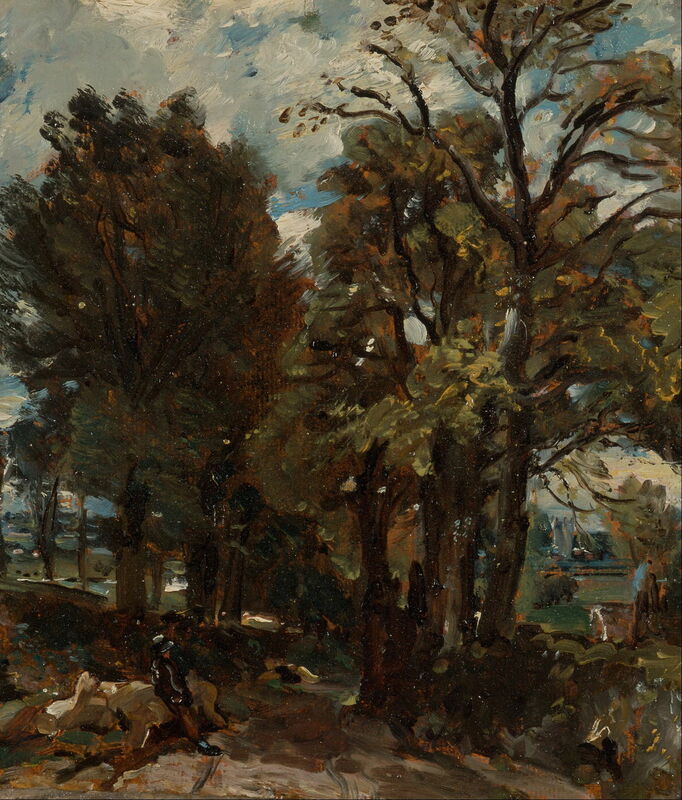 Most of his earlier oil paintings appear to have been as finished as those of Constable, as was expected by the Royal Academy and prospective purchasers. However, as his watercolour and oil styles tended to converge during the middle of his career, so his more radical oil techniques revealed some passages with visible marks. 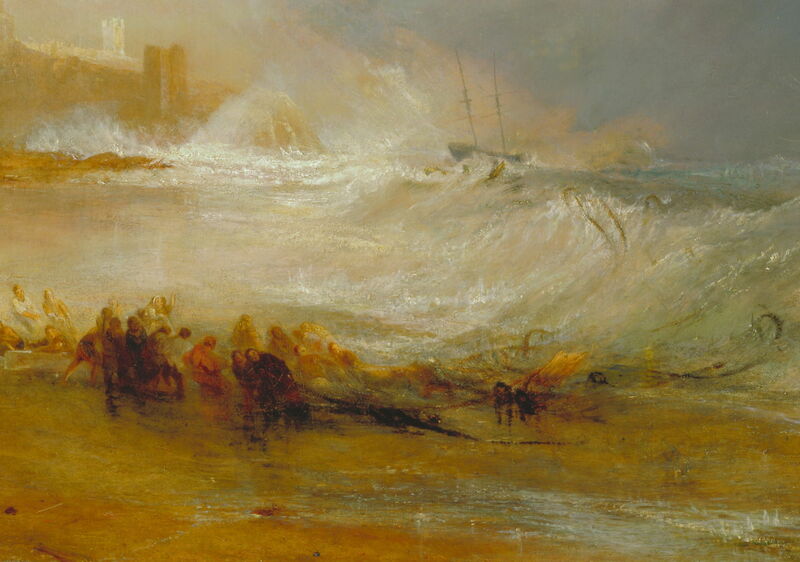 His large Wreckers – Coast of Northumberland, with a Steam-Boat Assisting a Ship off Shore (1833-4) could be mistaken for a watercolour, with its innovative treatment of the effects of light, waves and sea-spray, and general vagueness in form. Joseph Mallord William Turner (1775–1851), Wreckers – Coast of Northumberland, with a Steam-Boat Assisting a Ship off Shore (detail) (1833-4), oil on canvas, 122.6 x 153 cm, Yale Center for British Art, New Haven, CT. Wikimedia Commons. 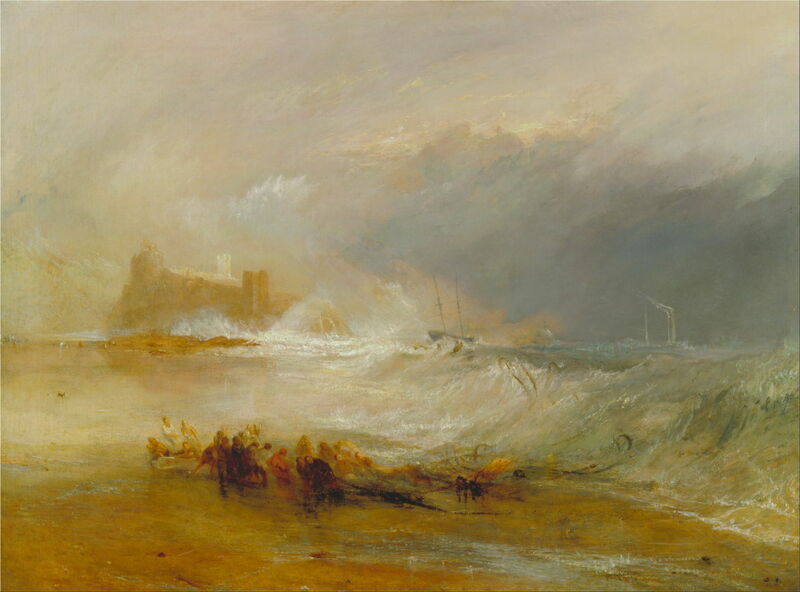 There are several small passages, for example in the waves and their spray, and the beach, in which Turner left the marks of the painting’s making. Joseph Mallord William Turner (1775–1851), Glaucus and Scylla (1841), oil on panel, 78.3 x 77.5 cm, Private collection. Wikimedia Commons. Brushstrokes and others marks are more evident in his late works too, his equivalent, perhaps, of Guardi’s capricci: here the mythological painting of Glaucus and Scylla (1841). 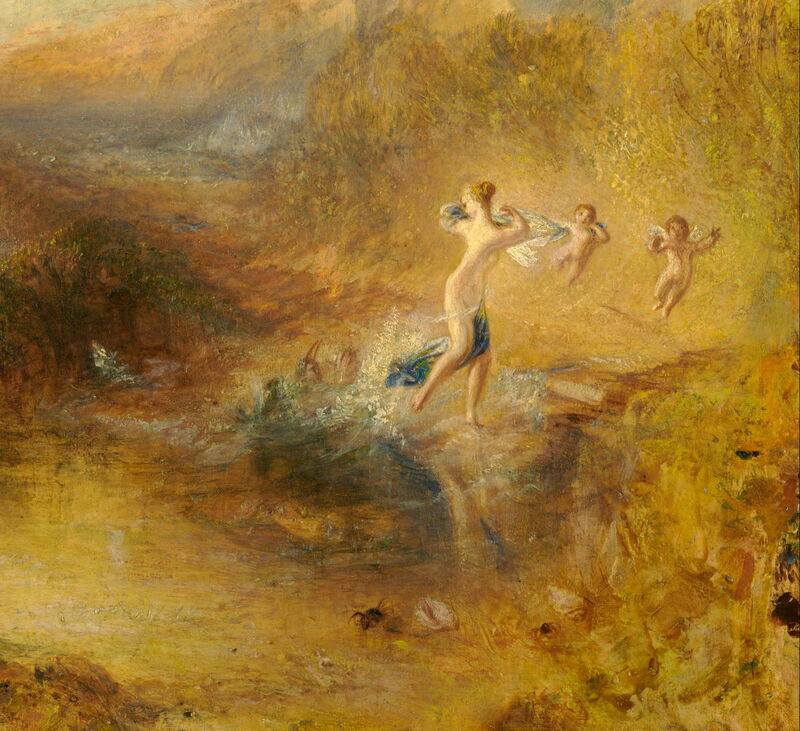 Joseph Mallord William Turner (1775–1851), Glaucus and Scylla (detail) (1841), oil on panel, 78.3 x 77.5 cm, Private collection. Wikimedia Commons. As in other examples, marks are often most visible in fabrics, but Turner also has passages which appear (when seen close, at least) to be just a jumble of near-random marks, from which some forms, such as the crab and conch shell, emerge. 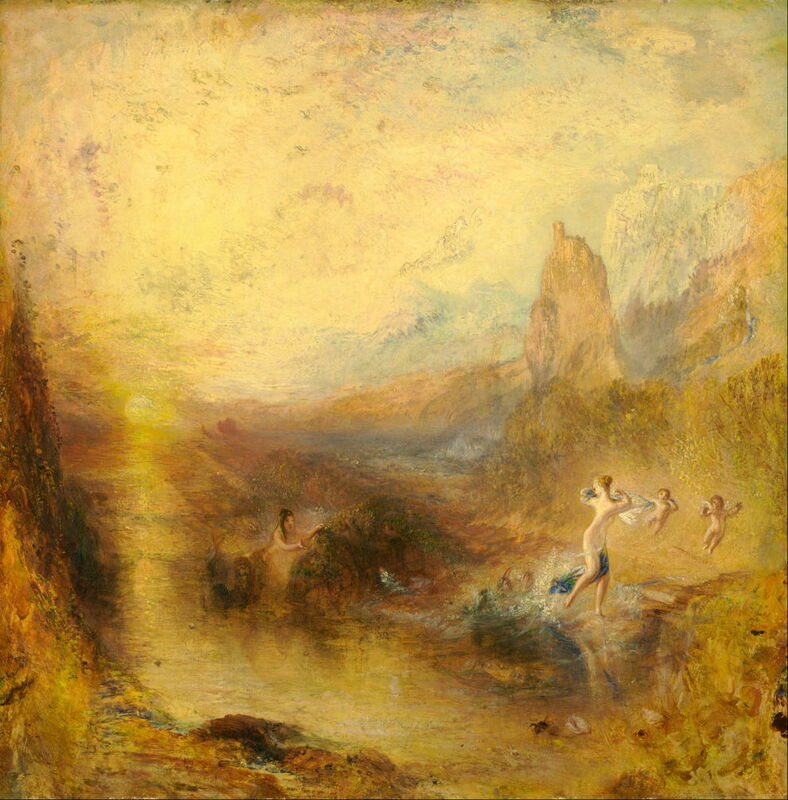 Inevitably, along with his general lack of form, and other aspects of his style, Turner’s gestural passages drew widespread criticism, but were an important influence on the Impressionists and the future of painting. An excellent study of his later works is Blayney Brown, Concannon and Smiles’ (2014) The EY Exhibition: Late Turner – Painting Set Free (ISBN 978 1 84976 145 1). On the European mainland, the early nineteenth century saw more artists presenting plein air paintings to the public, and the transfer of its techniques into the studio. 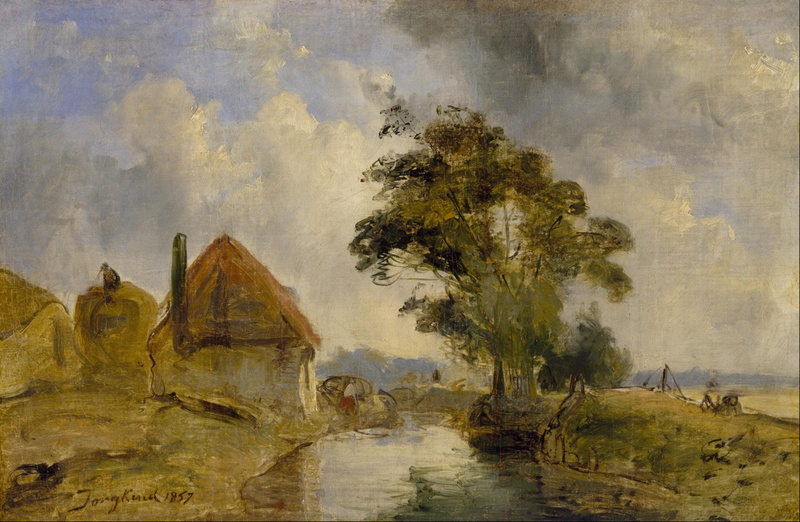 These are perhaps best illustrated by Corot, who was painting ferociously outdoors as Turner and Constable were at the heights of their careers. 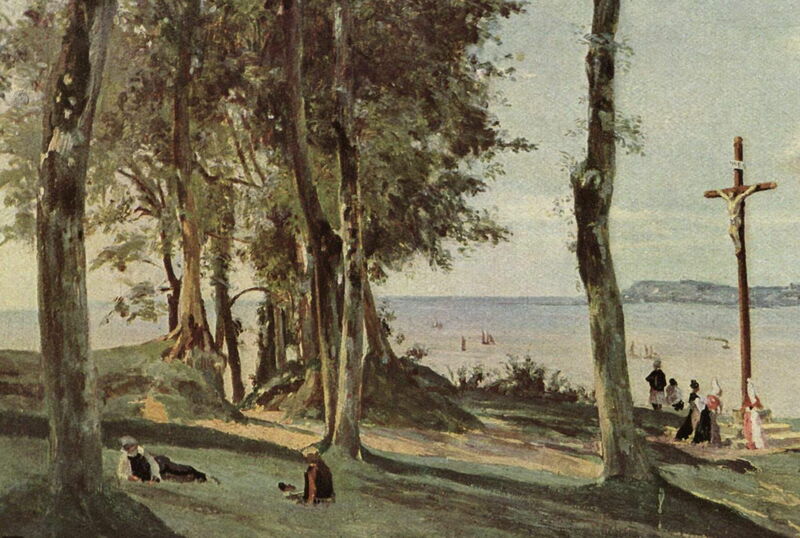 Corot’s earlier paintings, including those made plein air, usually attained a relatively high degree of finish, and lacked explicit brushstrokes and similar marks. 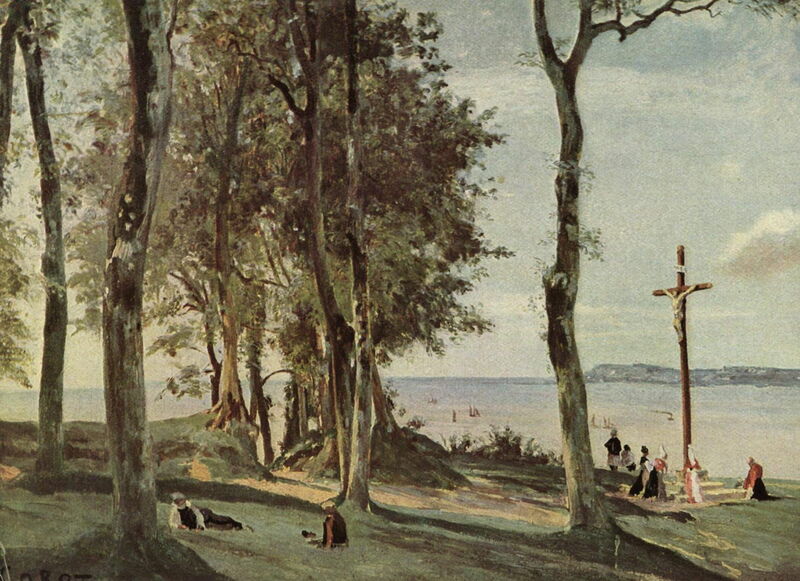 However, in Honfleur: Calvary (c 1830) his facture is visibly looser, and those marks more gestural. His marks are most visible in the bark and foliage of the trees, the latter being made up of a wide variety of different marks, giving them a distinctive texture. 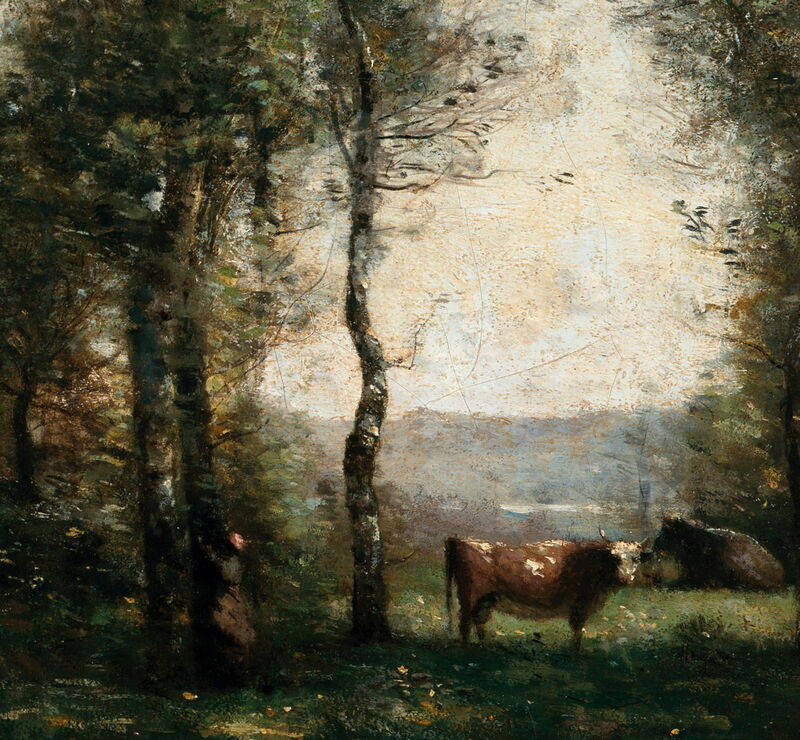 Some of his later paintings, such as Wooded Landscape with Cows in a Clearing (c 1855), also bear visible witness to his work with the brush. 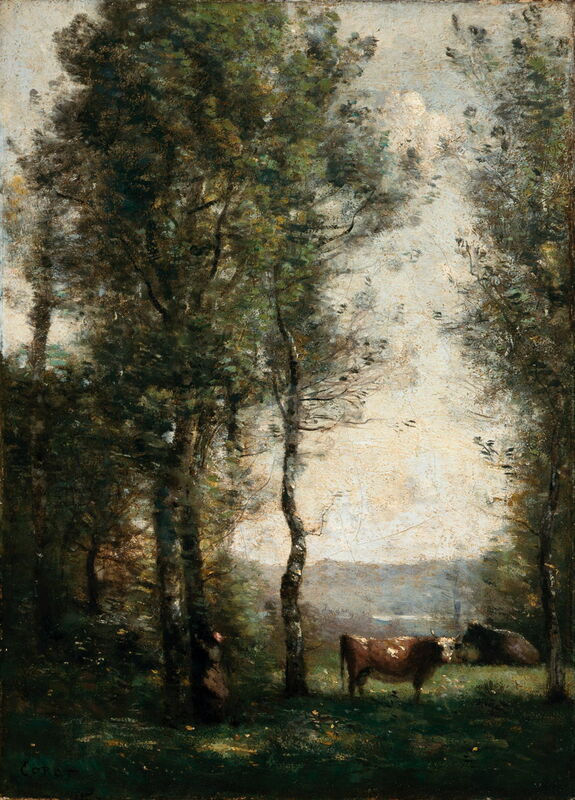 Jean-Baptiste-Camille Corot (1796–1875), Wooded Landscape with Cows in a Clearing (detail) (c 1855), oil on canvas, 41.9 × 29.8 cm, Los Angeles County Museum of Art, Los Angeles, CA. Courtesy of Los Angeles County Museum of Art, via Wikimedia Commons. Daubs and squiggles of light colours adorn the brown cow and the bark of the tree-trunks. Other painters were even more overt in their use of visible brushstrokes: Jongkind, another important influence on Impressionism, was leaving them in his plein air paintings in the middle of the nineteenth centry. Johan Barthold Jongkind, Environs of Breda (1857), oil on canvas, 30.3 x 45.6 cm, Museum of Fine Art, Houston. Wikimedia Commons. In Environs of Breda (1857) marks are not just used to impart texture, but are the architectural basis of the whole painting. The tree, cottage, banks, even the water surface and clouds, are here made up of visible brushstrokes. Although Jongkind never achieved the recognition that he deserved, by 1860 brazen marks were starting to appear in the paintings of the reputable and established, such as Delacroix. 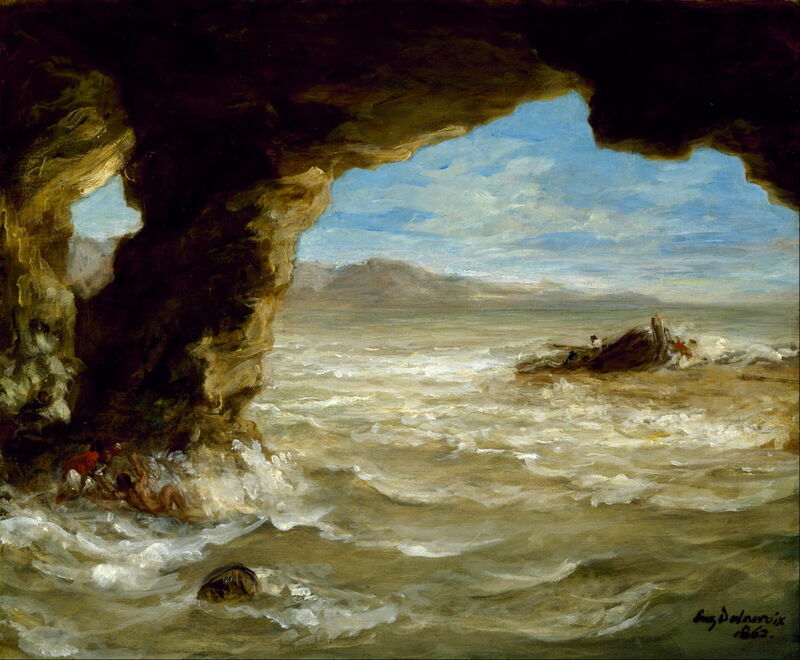 Eugène Delacroix (1798–1863), Shipwreck off a Coast (1862), oil on canvas, 38.1 x 45.1 cm, Museum of Fine Arts, Houston, TX. Wikimedia Commons. 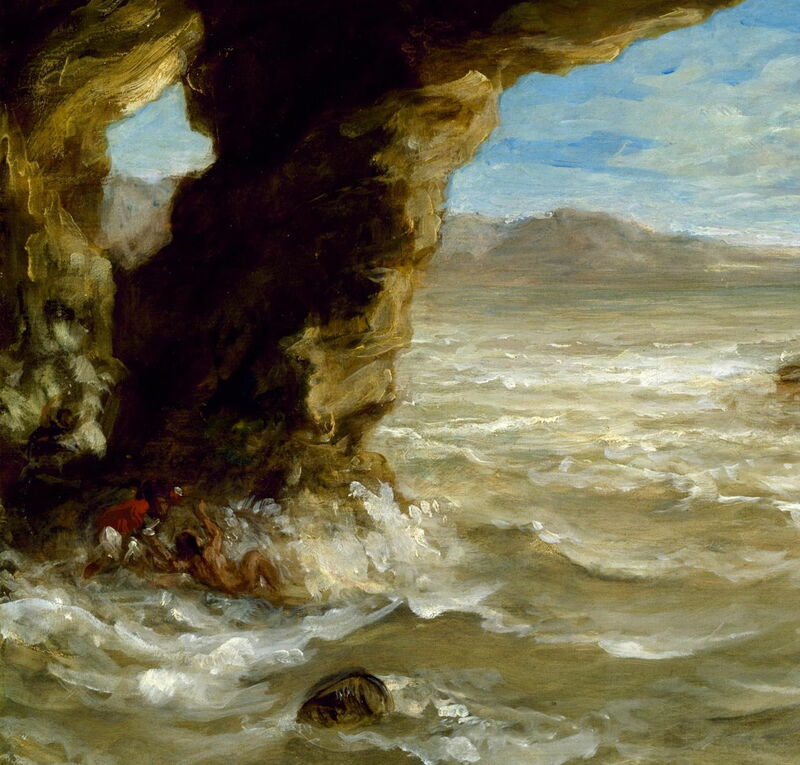 As with Turner before, and Courbet later, Delacroix left his marks in the foam and rough surface of the sea in his Shipwreck off a Coast (1862), one of his last paintings. 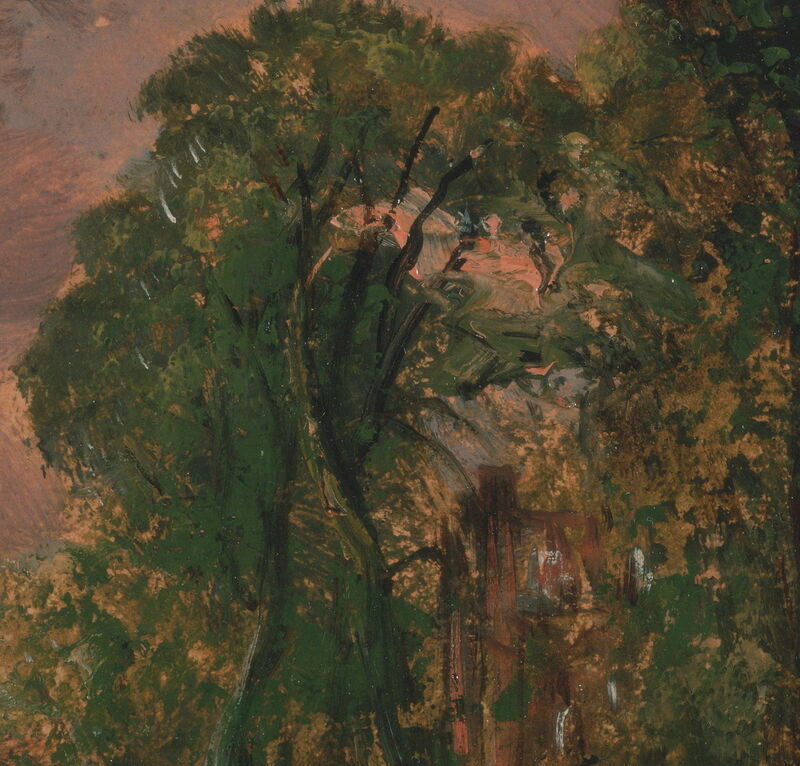 Look closer at this detail and it is clear that most of the painting is built up from brushstrokes: this was obvious direction for the Impressionists. This is one theme explored by Noon and Riopelle (2015) in their book Delacroix and the Rise of Modern Art, reviewed here. Posted in Painting and tagged brushstrokes, Constable, Corot, Delacroix, gesture, Guardi, Jongkind, knife, mark-making, Monet, painting, Turner. Bookmark the permalink.